Graphene, which is a two-dimensional material, may be only one or two atoms thick, but they are poised to revolutionize composites, power flexible electronics and even clean water. Still, being this thin is a disadvantage: the functional properties that people rely on will change if the material becomes contaminated. Fortunately, many 2D materials display the ‘self-cleaning phenomenon’, signifying that when different 2D materials are pressed together, stray molecules from the lab and the air are pushed out leaving large areas without any impurities. Ever since graphene’s isolation in 2004, a whole range of other 2D materials have been found, each with a variety of different properties. The potential of these new materials comes into play when graphene and other 2D materials are combined. Layering stacks of 2D materials in a specifically chosen sequence can generate new materials called heterostructures that can be fine-tuned to accomplish a particular purpose (from LEDs, to water purification, to high-speed electronics). These flat regions have yielded some of the most interesting physics of our time. Presently, the assumption that these areas are fully clean is under research. 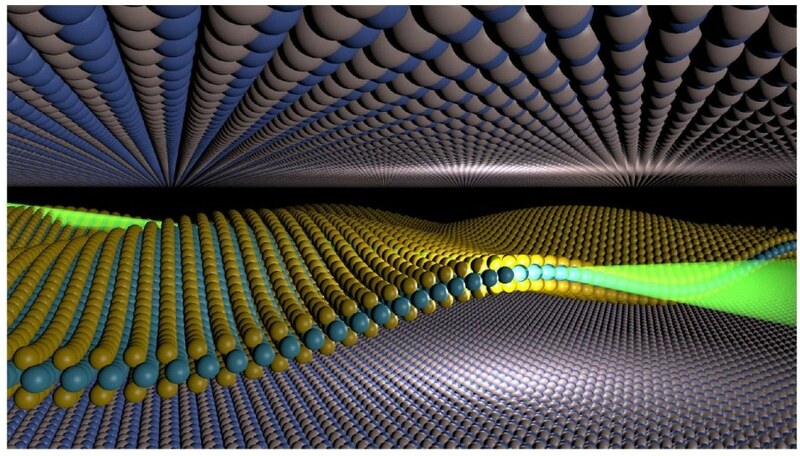 Writing in Nano Letters, a team of Researchers at the National Graphene Institute at The University of Manchester have demonstrated that even the gas within which the 2D material stacks are assembled can have an effect on the properties and structure of the materials. They found that for one class of 2D materials, known as the transition metal dichalcogenides (TMDCs), some had a very large gap between them and their neighbor. The theoretical calculations done by Dr Rudenko and Professor Katsnelson at Radboud University, Netherlands could not explain this distance. All these observations seemed to indicate the presence of impurities between the 2D materials. To verify this, 2D materials were stacked in a pure Argon gas atmosphere by means of a sealed chamber (known as a glove-box) in which the environment can be fully controlled. Although the same material had given huge gaps between neighbors previously, this time distances matching those predicted by theory for a clean interface free from impurities were observed. The consequences of this research will have a direct impact on how graphene devices will be made for future applications, illustrating that even the environment within which 2D material stacks are assembled will have an effect on the atomic properties and structure. This work was funded by the UK Engineering and Physical Sciences Research Council (EPSRC) and its NOWNANO Doctoral Training Centre, the Royal Society, the US Defense Threat Reduction Agency and ERC starter grant EvoluTEM.